Ottawa-based intelligent IP video provider March Networks has unveiled a new hybrid video recording platform that supports high-definition (HD) analog video in addition to all-IP and standard analog video channels. The 8724 V Hybrid Network Video Recorder (NVR) is designed to help organizations take sharp HD video using existing analog infrastructure, while also eliminating the cost and disruption that usually comes with replacing coaxial cable with Ethernet. The new platform will be available in mid-September, with HD analog support following shortly after. March Networks’ new NVR platform works with its new cloud-based Searchlight for QSR service powered by 360iQ launched in July, which provides video and retail data analytics service for the quick service restaurant and fast casual markets. More broadly, the company’s hybrid video recording platform is aimed at helping retailers, financial institutions, school districts and other organizations to transition to an HD video platform at their own pace without huge capital expenses. 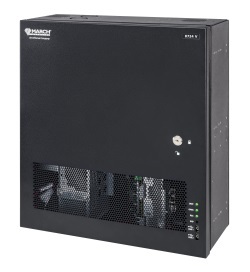 The 8724 V Hybrid NVR uses analog power and Power over Ethernet (PoE) modules to support a variety of IP and HD analog video configurations, up to a maximum of 24 channels. This enables organizations to mix and match IP and analog cameras: They could deploy the 8724 V to capture HD video from eight HD analog and 16 IP cameras at one location, and eight IP and 8 HD analog cameras at another site. The 8724 V uses a customized embedded Linux OS that eliminates unnecessary background services and frequent system updates, and the recorder can be maintained with March Networks’ free GURU Smartphone App to enable instant configuration audits, troubleshooting, warranty checks and other capabilities using a smartphone or tablet.